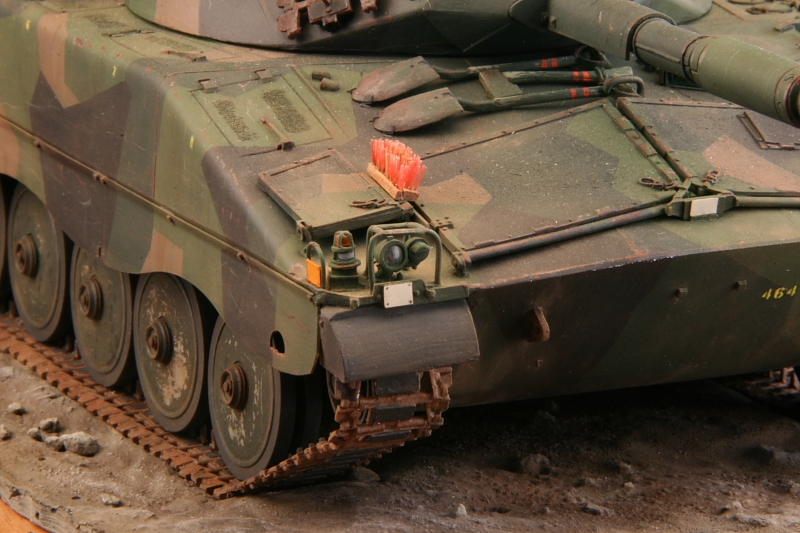 The IKV 91 (Infanteri KanonVagn 91) is not what many think, -a tank. It is a lightly armored, self-propelled anti-tank gun, intended to increase the anti-tank defense capability in infantry troops on brigade and battalion level. 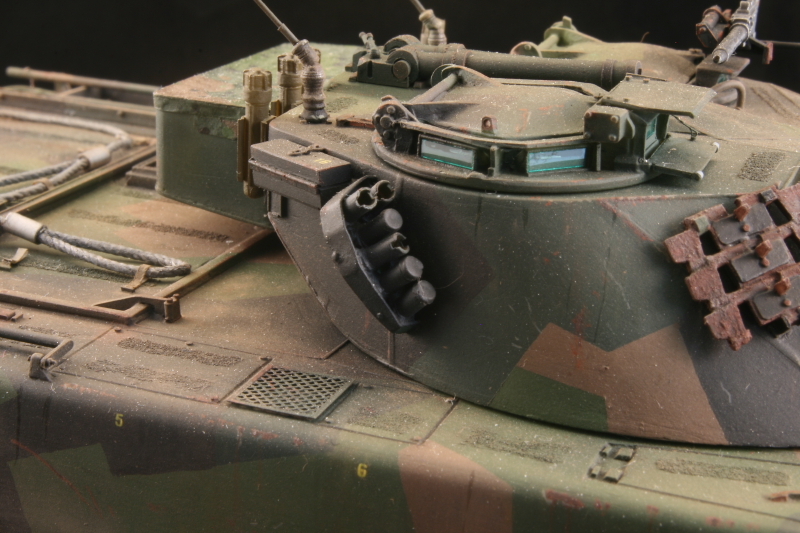 The IKV 91 was intended to rely on terrain and mobility and fire against enemy armor from flanking positions using hit and run tactics. The real tank guys in Sweden, -operating Centurions, often referred to the IKV 91 as a “rain sheltered anti-tank gun”. Beside the point; the Centurion guys also disqualified the S-tank as it lacked a normal turret. 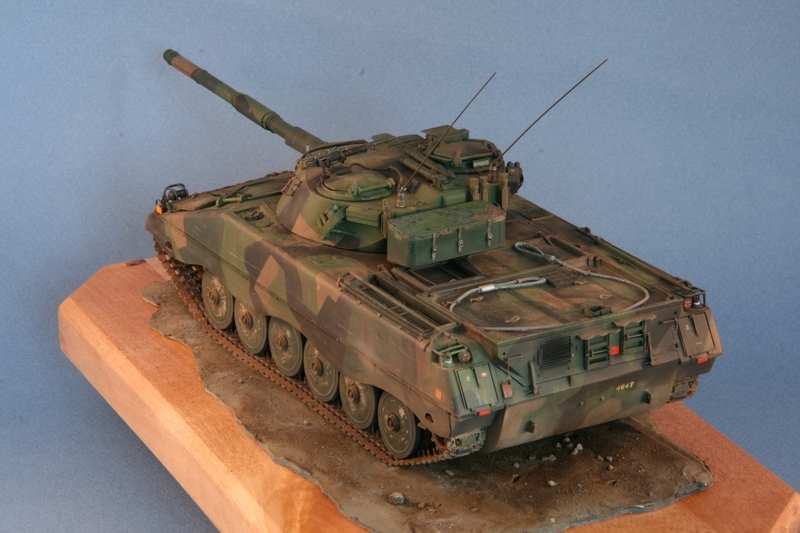 Anyway, the IKV 91 was never intended for a head on tank style assault. 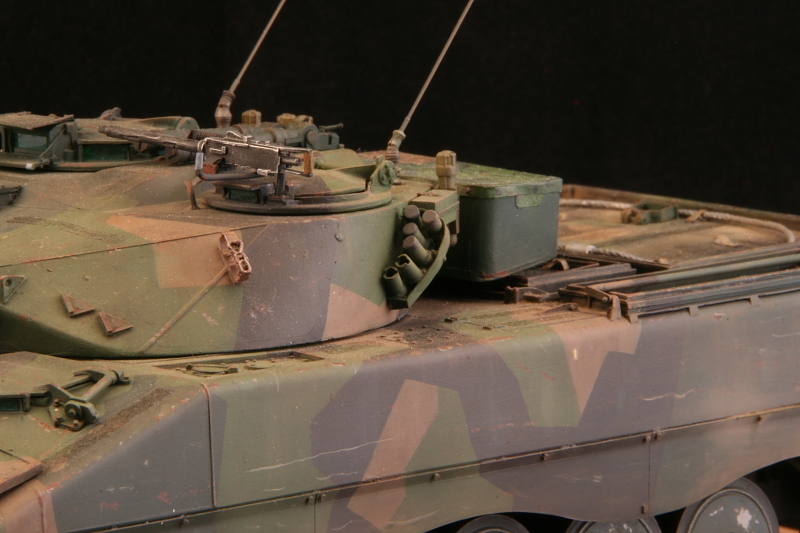 The low-pressure 90mm gun fired HEAT grenades and could also fire HE and smoke grenades. I have planned to scratch build the IKV 91 for quite some time until the quite wonderful offering from HobbyFan appeared. The kit is very nice and goes together quite well without any real challenges. The experienced builder should have no big issues putting the thing together. I did not find many air bubbles to fill. The only part that needed some putty due to trapped air was the rear part of the lower hull where I found three small cavities. This was easily taken care of with some cyano acrylate and baking soda. Those who know me can tell that I am completely incapable of building something out of the box, so there are a few minor modifications that I made. Some things are not well suited for making as resin moldings since they will become warped. I did make new foot rests on the sides of the engine deck as the kit parts where badly warped. I decided it was wiser to spend the time soldering new ones from brass tube and brass sheet metal than to try to straighten the ones provided in the kit. I am rather happy with the result. 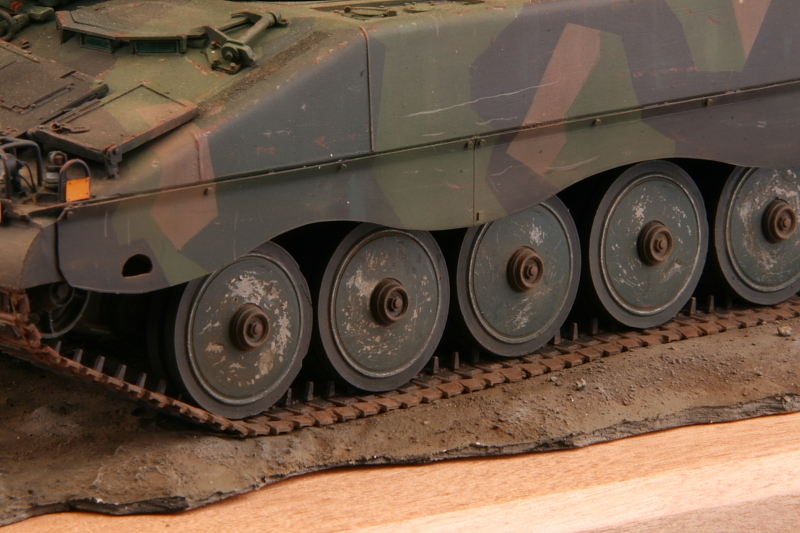 I also made some thin chains which appear to be provided on the rearmost end of these foot rests on the real vehicle. I carefully carved the recess in the rear lights a bit deeper and made a “lens” from clear sheet styrene which I spray-painted with some clear red Tamiya. I also made some wiring to the light appliances. The standard towing cable has to be scratch built as it is not found in the kit. Also the side skirts were badly warped and curved in my kit. It was a no-brainer to realize that it was much easier to cut new ones from 0.5mm sheet styrene, than to try to flatten the kit ones. The smoke grenade launchers in the kit are provided with smoke grenades, something rarely seen during exercises. The launchers were mostly empty and capped, -caps that sometimes were lost. I made new launchers from styrene tubes turned and drilled to the correct diameter. I also made a few caps and made sure that I lost a few. There should also be a support bar on the rear side of the launcher. This part seems to be missing in the kit, but simple to correct. While discussing items on the turret, -a trick I often use to give some depth to vision blocks is to carefully cut an exact match of the molded vision block front face in clear 0.13mm styrene. I always make a few extra of every size for the carpet monster. I then arrange a piece of masking tape with the sticky side up and place all my vision block front faces on this. Next step is to spay coat, -what is to become the back side, with a mixture of Tamiya clear blue and clear green. This coat should be rather thin as the color will become deeper when mounted. After having painted and weathered the kit, these vision blocks is glued into place with some white glue. The front face of the vision block will become perfectly plane and will give the same type of reflection as the real thing. Another feature on the turret is the Lyran illumination grenade launcher. First, the kit part seems a bit too small. 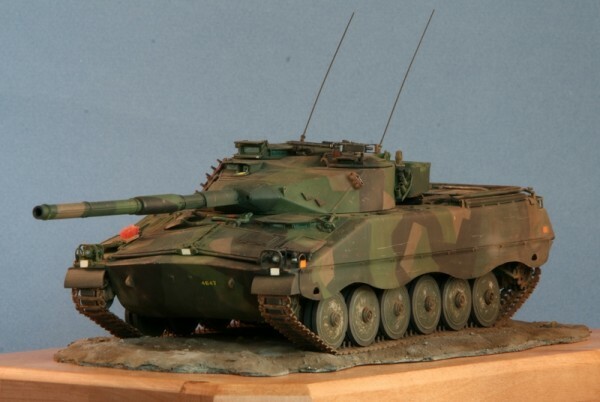 Luckily I happened to have a set I scratch built for a CV 9040C some years ago. Now it could find a better home. The instructions also seem to indicate that you should put two sets of Lyran, 4 in all, on the turret. As far as I know, this is incorrect. 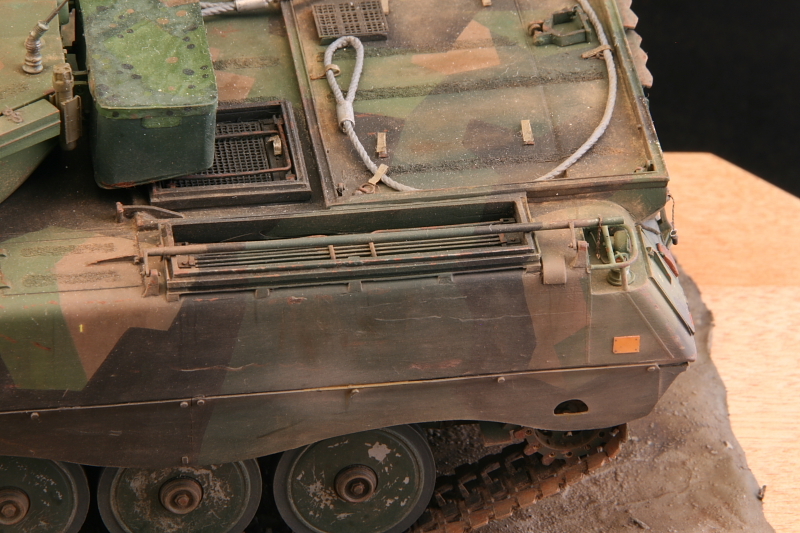 You have to choose between the storage position on the left side of the turret and the operating position on the turret top. I used the kit parts for the stored Lyran to make the clamps used for securing them. 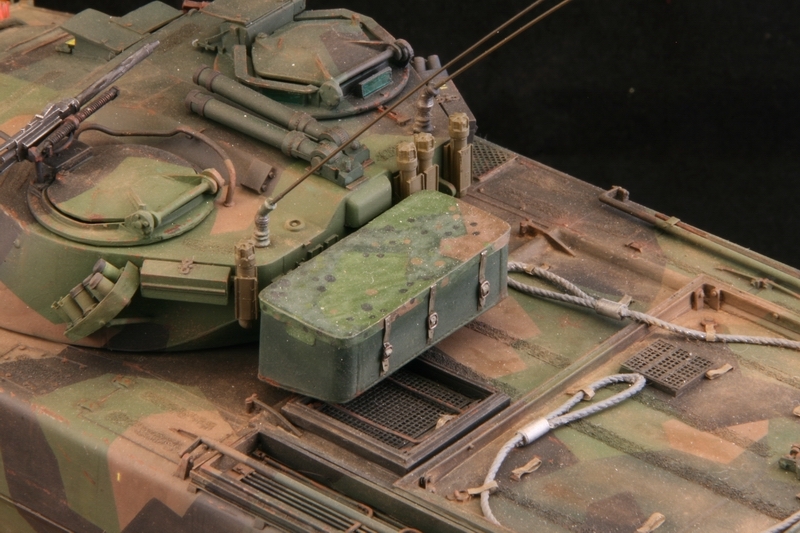 The storage box on the rear side of the turret often had a tarpaulin cover. This tarpaulin was either olive green or provided with the standard splinter scheme with dots to break the pattern. I made this cover from tissue paper impregnated with white glue. The cover was then masked and painted in several steps finishing off with the dots followed by a coat of thinned white glue to get that plastic feeling of the tarpaulin. Some buttons and straps were also made. The attachment bars of this storage bin are rather thin, as on the real thing. It is advisable to reinforce this with some steel or copper wire pins. The headlights were drilled out, provided with the shape of a reflector and painted with Gunze silver, which easily can be polished to a high metal gloss. The headlights were finished off with a clear homemade lens. Also here some wiring was applied. The turn indicators were drilled out and small clear pin was milled and painted with Tamiya clear orange. I have done this a couple of times by now as the same turn indicator also is found on the Strv 122. 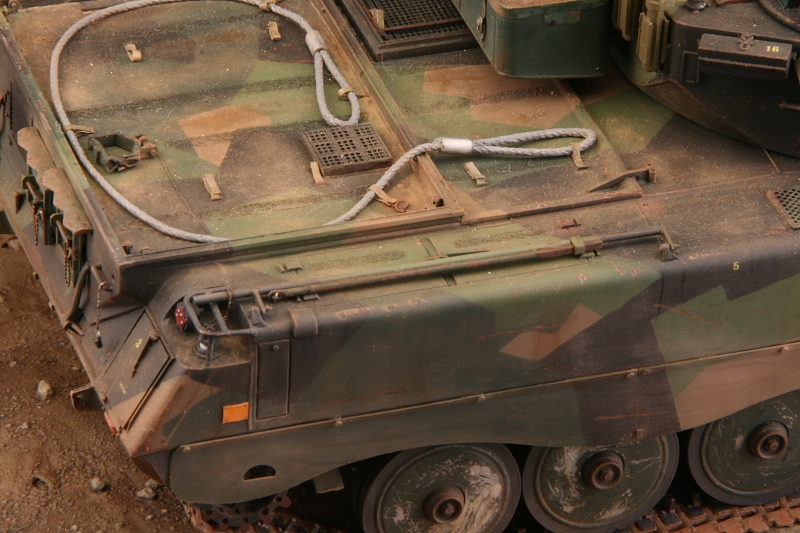 There are a few areas on the vehicle provided with anti-slip texture. I decided to add a little depth to this by basically doing the same thing I did on the Strv 122 (-can be found on this site). However, instead of spraying the repro-glue I decanted and thinned it with some synthetic thinner and brushed it on. Once dry, it becomes a very thin sticky layer. I then sprinkled 70µm (0.07mm) particles and pressed them down with the top of my fingernails. Access particles where then gently blown, shaken and brushed off, followed by a layer of black acrylic paint to seal the anti-slip structure. The stick-less broom is almost a standard on Swedish vehicles, -why you may ask? When it is wet, your boots will catch a lot of mud. This mud will then fall off inside the combat compartment. So, by simply rubbing your boots against the broom before stepping down into your office, your day will be a bit tidier and the post exercise cleaning will be so much quicker. Those of you who have tried to sweep the floor in combat compartment know what I am talking about. I used a wooden coffee stirrer as the base for my broom (in Swedish, piassava-kvast). I drilled 0.3 mm holes as tight and as tidy as I could. I used the strands from a bristle brush (a stippling paint brush made from hog hair) dyed red and cut to length. I then packed as many strands as possible, using pliers, in each hole on the broom head and sealed it from the back side with some CA glue. A bit of trimming of the bristles and it could find its correct place on the front of the vehicle. The road wheels on the IKV91, is provided with detachable hubs that is supposed to improve flotation. I picture these as being made of thin aluminum plate having a cavity which I suppose is filled with some expanded plastic like Styrofoam. On the vehicles I have seen they are dented, buckled and the paint is chipped. It is indeed very difficult to get paint to adhere to aluminum. Here is how I tried to depict the wear; -the first thing I did was to simulate a few random dents with spherical milling tools and some fine grade sandpaper. As a next step I painted them with a light grey semi gloss acrylic paint. After drying, I used alu pigment from a dried out can of Gunze alu paint. It actually works perfect as an aluminiser, -you simply polish the “pigments” into the surface. After that I brushed some decanted silicon spray (-basically the hair spray method) onto the aluminised wheel. Be careful with hygiene since silicon will destroy most paints! I then spray painted the wheels green. This had to be done in several light coats as the paint, as intended, will not adhere well to the surface. Once dry it was fairly easy to create chipping with a short strand stiff brush. For the rubber I use Vallejo flat black with a fair amount of flat flesh. I did not particularly like the tracks provided in the otherwise wonderful kit. In my kit around 20 of the guide horns were missing, probably broken off during transport and I had to make and attach new ones. If only Friulmodel or anyone else could make an aftermarket track set. I airbrushed the vehicle black followed by the dark green. I then masked and airbrushed the light green followed by the brown color. I used Tamiya acrylic for all of these. I actually brush painted the black parts of the splinter scheme using Vallejo black with a dab of green. I have found that particularly the flat black Vallejo is possible to brush with ease and it will still be as even as if where air brushed. I saved a lot of time not having to mask off this area as well. I then went ahead and airbrushed the whole thing with Vallejo satin clear coat. Yes, I have found that semi gloss will be sufficient when applying, at least, smaller decals as well as for the washing process. I made some color mods using various color oil paints rubbed into the surface. I assume most readers are familiar with this technique. 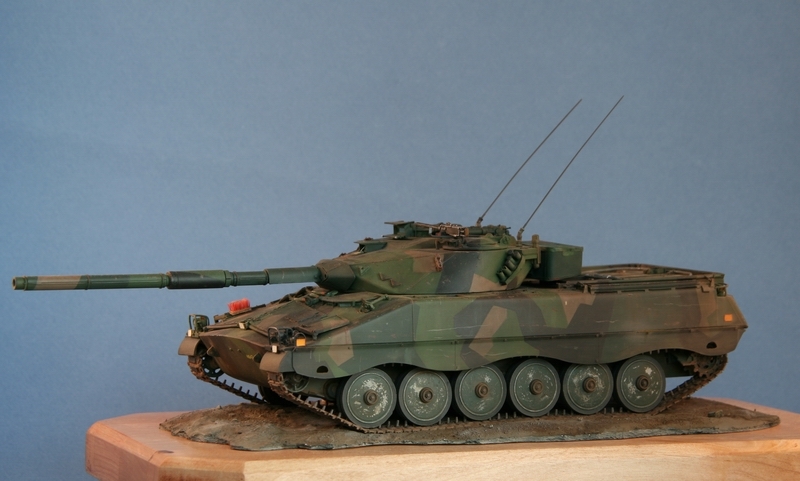 I then applied the decals from the Echelon range Strv 122 series using micro-set and micro-sol. After having fixed the decals with local coat of Vallejo satin, I washed the whole kit with turpentine mixed with some black and burnt umber oil paint. I then went ahead with some pin washes, making rust stains, chipping, scratches and pigments. The whole contraption where then airbrushed with flat Vallejo clear coat followed by some dust using Tamiya buff, flat earth and some more pigments. All in all, the HobbyFan kit is very good, easy to assemble and I for one would really like to see more of these kits built. So far I have only seen two, -my own included. 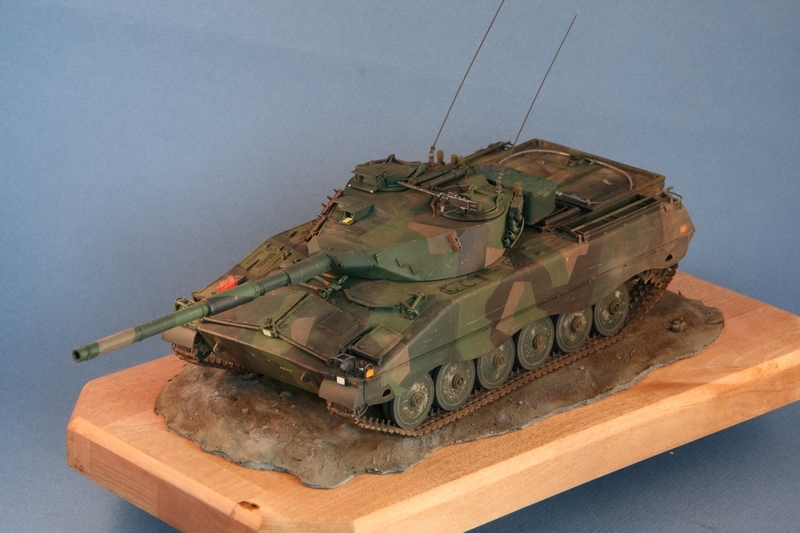 This entry was posted in Build blog, Finished work, Swedish Plastic and tagged 1/35, Hobby Fan, Ikv 91, Ingvar Sylegård, Resin kit. Bookmark the permalink. Super model, Ingvar, it was a pleasure to see it at C4 last year. I love the wy you did the vision blocks, something I plan to try very soon.. Thanks for a great article..! Gorgeous model, Ingvar..! It was great to see it live at C4 as well. I love the way you did the vision blocks, they look fantastic. This I must definitely try on my next model. What colour did you paint the plastic behind the blocks? I assume you used a light colour, such as Silver or White that will “shine through” the blocks slightly? Hi Sven, Thank you for the feed back, and glad you liked it. I do not believe I painted any bright colours behind the vision “blocks”. If my memory serves me right I actually used flat black or dark green. I am using Evergreens thinnest clear styren sheet, and that actually catch the light anyway. I believe light colours may make the vision blocks a bit too bright. Thanks for your very fast response, I very much apreciate the answer. You mentioned that you painted the vision blocks with a mixture of clear green and clear blue. Did you use both colours on all vision blocks, or did you vary the colours you used on each block (eg a few blue ones and a few green ones to depict differences in the way the glass catches the light).? -no, I actually mixed some tamiya clear blue and clear green and spray painted it on the vision blocks cut to format. I used a lot of thinner. The clear range does not dilute well with anything but Tamiyas own thinner. You will get a build up of colour on the edges, which increase the perception of depth. Make sure you turn the painted side inwards. Just to be clear, I am not trying to depict the modern laser reflecting coating you will see on conteporary US vehicles today. I am currently trying another technique for that. I will try this method as well, it really depicts glass vision blocks (without the laser-reflective coating) very effectively. Hopefully I will be able to get similar results..
Look forward to seeing your progress on the reflective coating as well. Did you see that AFV-club released some kind of stickers for simulating laser reflective coating? I saw some review on Armorama I think. -yes I have seen AFV-clubs offering. I plan to order a set for evaluation. Evonik have a coated 3 mm thick dichroic (in practice iridescent) coated arcrylic sheet that looks spot on. Requires the work to mill into a vision block though…. Hi! very nice job! realy like it. Do the photoetsed parts includes? i bought one of this tank but my box do not contain it, but it’s in the drawing. -yes, there should be a small PE fret with venting nets in the kit. The same parts are also provided as a resin version. Hi Jérôme, glad you like it and even happier your hooked on Swedish army stuff. 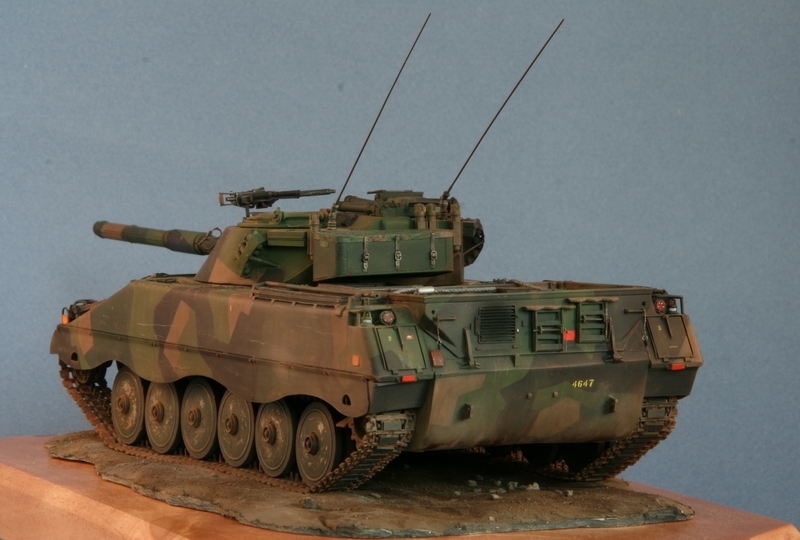 I have seen the Firing Line BV-206 and the resin parts seem very nice. However, I have never seen one finnished, it seems like everyone gives up when it comes to getting the photo etched tracks together. I would probably through them away and scratch build them instead. The brown is a bit tricky as it varies a lot, and I mean a lot with age. XF68 is a bit to red and XF 52 is a bit too bright and too gray, mix the two 1:1 and perhaps add a dab of XF1. In black and white photos it should be very difficult to see the difference between the brown and light green. I believe I used XF52 with some XF1 added. I also remember it ended up too bright in my view. However after a wash with black and burnt umber oil in turpentine it turned out rather well. good luck, and please show your BV 206 on this site, we are dedicated on Swedish armour and sometimes non-armoured vehicles.